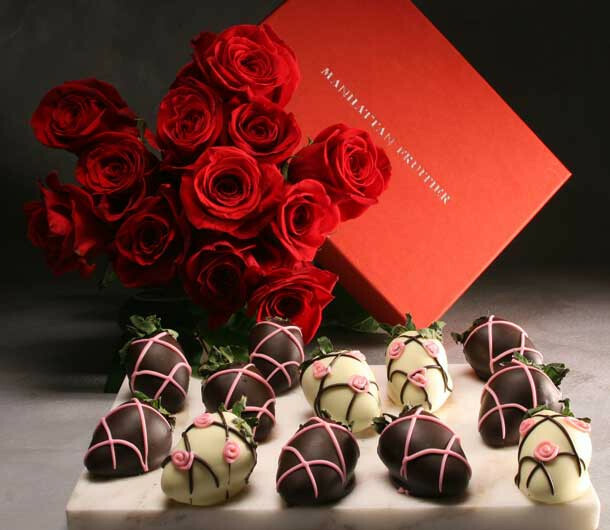 Our passionate pairing of voluptuous roses and chocolate dipped strawberries express your love in the most elegant of ways. Sumptuous Belgian Chocolate-dipped Strawberries transcend any you have seen or tasted before. These luscious berry baubles, hand-painted in a rose lattice design and hand-dipped using premium strawberries and luxurious Belgian Couvertures are nestled in our signature red box. A delectable treat, perfect for a romantic evening for two. 12 strawberries in each box: 4 white, 8 dark. Packaging may vary from image.